Chateau le Verdoyer is a beautiful and well maintained campsite that lies within approximately 25 hectares of wooded parkland on the estate of a 19th Century Chateau. The campsite is located near to Champs-Romain which is a tiny village in the Perigord Vert area of the Dordogne which is named so because of the its vast amount of green coloured lakes, forests and fields. You’ll find that the Perigord Vert area is less busy than some of the other areas of the Dordogne which is perfect for those wishing to get away from the crowds and for those looking for a really relaxing holiday. At the heart of the campsite is the Chateau which is very beautiful and stands overlooking many of the facilities and also the lake. Many of the campsites main services are housed within pretty stone faced buildings that surround the central courtyard of the Chateau which adds to the pleasant feeling of this superb campsite. At the heart of the campsite you’ll find two fantastic lakes, one for fishing which is right next to the Chateau and another one for swimming. The lakes are one of the most popular features of the campsite alongside the brilliant pool complex. Within sight of the Chateau are the campsites swimming pools. 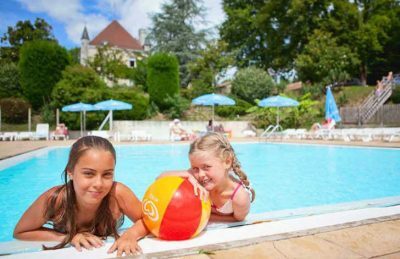 For the number of pitches, Chateau le Verdoyer offers a pretty good range of swimming facilities including an indoor heated pool, 2 outdoor pools, a fantastic 37m long waterslide and plenty of sunbathing areas. Chateau le Verdoyer is a great family friendly campsite which offers a comprehensive range of on site activities and facilities. On site activities at Chateau le Verdoyer include a multi sports field, table tennis, tennis court, boules, cycle hire, fishing and a playground. Facilities available at Chateau le Verdoyer include WIFI, snack bar, restaurant, takeaway, bar, groceries, animation team, games room, tv room, washers and dryers. Accommodation at Chateau le Verdoyer campsite includes a range of fantastic tents that are available from Suncamp.